All particles are always mixed together so intensively that a uniform treatment temperature is ensured across the entire fluidized bed. This not only enables a drying process that is very easy to control, but also gentle handling of temperature-sensitive materials. Glatt boasts a uniquely broad portfolio of different system concepts for implementing product ideas with a diverse array of requirements. Batch-mode or continuous operation, single or multi-stage process management, vertical or horizontal material flow – these many options allow us to work together with you and pursue an open-ended approach to process development and systems engineering. Each system series was developed for specific areas of application, thereby allowing you to achieve your product developments. Both concepts can be used for all process options. Nevertheless, they have very different properties in terms of fluid mechanics and process dyna­mics, opening up the possibility of additional potential for innovative ­particle engineering and product design. Systems featuring the round ­fluidized-bed floor are used primarily when it comes to particularly intensive mixing of the fluidized bed. The diverse array of configurations includes different filter systems, various nozzle and spray systems, flexible solid inputs, granule discharges, and the classifying output for continuous operation. Glatt GFG fluidized-bed granulators, featuring the elongated, rectangular fluidized bed, enable targeted material movement through the process chamber. If necessary, this can be divided into zones. This allows the particles to be subjected to various process conditions one after the other in a targeted way, enabling multiple process steps to be undertaken in the same system (e.g., granulation, drying, and cooling). And all this can be done in continuous operation. The ProCell series combines the innovative spouted-bed concept with the flexibility and multi-zone concept of a GFG. The main areas of application are the granulation of fine particles, processing of materials that are sensitive to temperature and retention time, and processing of sticky materials. 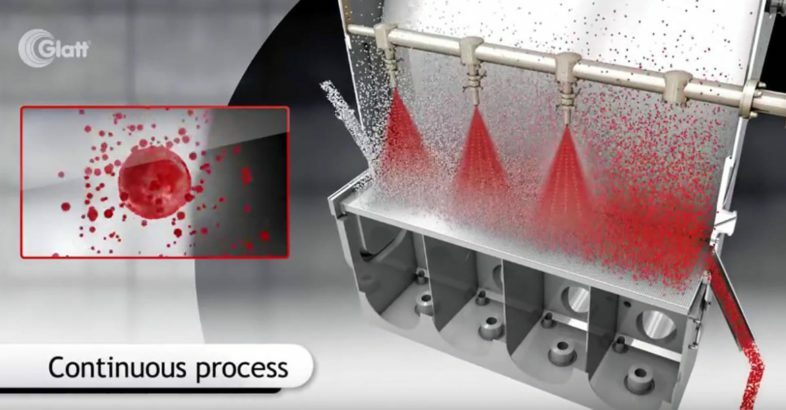 Whether it is simple particle coating in the top-spray method or functional film coating in the bottom-spray or Wurster method – it is always important that the spraying of the particles is as even as possible in all coating processes. A special, cleverly designed process chamber construction, in combination with high-quality spray systems, makes this possible – whether with round or rectangular apparatus geometry, the chamber can also be divided into multiple zones or chambers if necessary. Glatt spray granulation, spray agglo­meration, spray encapsulation, and spray coating with innovative ­fluidized-bed or spouted-bed technology are ideal processes for manufacturing high-quality granules and pellets, which may be structured and functionalized according to specific customer requirements. Glatt guarantees process parameters and product properties such as capacity, particle size, or bulk density to ensure the reproducible quality and cost-effectiveness of your system.